On this large piece of Velum, one can see the development of the concepts that Greg has pulled from his dreams. These figures would fill Greg's dream painting, and he would obsess about the flesh stretched on the rack beside them. The figures are ominous and threatening, their faceless forms in bloodstained, tattered garments. This is not an image for the feint of heart. 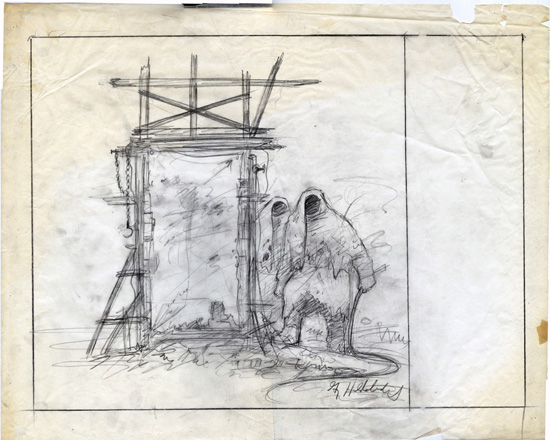 Though it is perhaps best known for being the cover of Black Sabbath’s 1981 album, Mob Rules, this drawing, and the subsequent painting, was not originally created with that intention. Originally titled, “Dream 1: Crucifiers,” this 1971 painting was from a series of dream paintings, and it has a little known but very important origin for Greg. In 1963, Greg and his brother, Tim, started to work for the Catholic church under the warmth and guidance of Bishop Fulton J. Sheen, a man for whom Greg still has great love, admiration and respect. For 6 years the two brothers worked for the church making documentary films on world hunger. In the middle of that six year period, Bishop Sheen was transferred to a different diocese outside of his original Manhattan location. In 1969, those who had replaced the Bishop closed down the projects Greg and Tim had been working on, thus ending their involvement with the church, and beginning the end of Greg’s connection to the Catholic faith. “Dream 1: Crucifiers” was originally published in 1978 in the book, The Art of the Brothers Hildebrandt, published by Ballantine Books. Greg licensed the rights to Black Sabbath for use of this image exclusively for the album cover and advertising of the album after a request from their manager in 1980. Since the release of the album, this image has been used many times by Black Sabbath for merchandising, despite the fact that Greg never gave them permission. "To this day whenever I get interviewed I am asked why I painted Ozzie Must Die into the piece. Did I?"